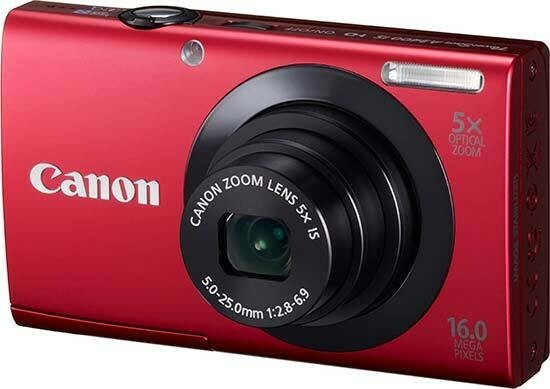 The Canon PowerShot A3400 IS is an image stabilised digital compact camera with a 16 megapixel CCD image sensor, 5x optical zoom starting at a wide 28mm, 3-inch touch screen LCD display with Touch Shutter and Touch AF functionality, 720p HD movies, live view control and a help button. Available in black, gold, red or silver for £129 / $179, at first glance the Canon PowerShot A3400 IS looks like it could be one of the most user friendly cameras on the market today - find out by reading our review. Once upon a time the Canon IXUS models were the good looking and well-made range of digital compact cameras. Now, it seems, Canon have shifted that pattern of focus and included some of the PowerShot range too. We're not talking about the top of the range £400+ PowerShot models, we're talking about the A3400 IS, a £120 budget digital compact point and shooter. Interestingly, from the front it looks a lot like an IXUS with it's blocky design and clean, straight lines. The colour co-ordinated 5x optical zoom lens sits flush with the rest of the body. On the top, a small power button is cosily pushed into the body with the silver shutter release button being the only thing that brings the design down. A black button would look so much nicer. On the back an indication of the actual price range is evident with the bulky screen that pushes the back of the Canon PowerShot A3400 IS out slightly. As usual the controls are squashed down the right side. We first thought that maybe they were a little too squashed but then realised that Canon have fitted slightly larger buttons which will be great for people with larger hands. Like competing touch screen cameras, it takes a while to get used to the responsiveness of the A3400 IS's touch screen when it comes to making function selections. Sometimes we found it rather easy to scroll past the setting we actually wanted in our haste to implement particular settings before a photo opportunity vanishes. By contrast at times we had to repeatedly stroke the screen to prompt it to respond a little faster. There is the ability to tap an on-screen subject for the A3400 IS to bias focus toward, which Canon fittingly refers to as Touch AF. If subsequently altering framing, the AF point will perform its little dance across the screen as it attempts to keep tabs on the subject originally selected. Cute. Otherwise you can just point and shoot as normal, AF points appearing on screen in the form of green squares to signal which aspect of the subject the camera has itself picked out. At the top is the dedicated video button. This will start video recording regardless of the mode you're in. Another way the internet has changed photography. After all, before the YouTube explosion, you had to choose the video mode in a menu system. Below this is a rather handy Help button. Pressing this button will give a quick explanation of the mode you've most recently chosen. The navigation pad is used for moving around the menu system but also doubles up with access to macro, flash, display options and mode switch. Pressing up switches between Auto and whichever Scene mode you've selected from the menu such as Program, Portrait, Landscape or Live View Control, to name a few. Pressing the Function menu button in the centre brings up a quick access menu that has all the main features that you're likely to use while shooting such as ISO, white-balance and resolution. Access to these features will vary depending on the mode you're in. If you want full access to all features, you need to be in Program mode. Otherwise the Canon PowerShot A3400 IS will blank out areas it thinks you don't need and it will handle those itself. If you've ever seen Live View on a DSLR, then you'll be pleased to know that the A3400 comes with its own version of it. It works the same way as normal shooting by allowing you to use the screen on the back to view the shot. However it also has three sliders for exposure, saturation and tone. They're labelled Dark/Light (exposure), Neutral/Vivid (saturation) and Cool/Warm (tone) to make them easier to understand what the end shot will look like. But the idea of Live View Control is that it shows you on screen what the changes will look like as you make them. It's much more versatile and will shorten the time you're sat there fiddling with the exposure compensation, colour filters and white-balance. The main menu has its own separate button below the navigation pad and it's easy enough to use. The background is a carbon black with a dark grey menu and orange highlight. Interestingly, this normally changes depending on the tab you're in such as shooting, playback or set-up. On the Canon PowerShot A3400 IS it stays the same. Canon include their modes in the function menu unlike other manufacturers that give them a dedicated button. This reduces the amount of buttons which means - in the case of the A3400 especially - that the buttons can be made a bit bigger. The outside of the Canon PowerShot A3400 IS is made of metal while the interior is plastic to save weight. We always say that the tripod bush is generally the bench mark for camera quality. Low end cameras tend to have plastic tripods but the A3400 IS has a metal one which is great. The Canon takes it's own lithium-ion battery which is located on the bottom of the camera next to the tripod bush. The SD slot sits next to the battery and is covered by a flimsy plastic door. The snap shut locking system is difficult to open and there's no metal on the inside of the door for additional sturdiness. The hinge also looks to be made of plastic. The video runs in Full HD which is nice but the sound is only mono which lets it down somewhat. The lens is a Canon manufactured zoom lens. It's nothing special but will get the job done. For a 5x optical zoom, the body is nice and slim although they've had to widen it a bit where the screen is. Most likely to accommodate both the screen and zoom lens. When the lens is out there's a little amount of play. This reduces as the lens is zoomed out, but not by much. Start-up time from shut down to taking a picture is around 2.6 seconds. Shutter lag sits at around 0.08 seconds. Both results are fairly standard in digital compact cameras on the market today. Continuous shooting is pretty slow but it doesn't have a buffer option for hi-speed bursts. It simply keeps taking pictures while you keep your finger on the button. We managed to get eight pictures in a 10 second period which gives an average of around 0.8 frames per second (fps). It took up until the 14 second mark to finish downloading. This shows that there is a small buffer that will hold any extra information but it's minor. Playback mode can be entered whether the Canon PowerShot A3400 IS is powered on or not. If it's off, the lens isn't poking out. If it's on, the lens will retract after a minute or so anyway. Pressing the help button in playback brings up some cool options. It teaches you what different buttons can do for you and how to perform simple tasks such as erasing pictures, returning to the shooting mode and what the touch screen can do in this mode. The playback menu is vast with options for searching your pictures, protecting them, editing them with features such as iContrast (a type of HDR), red-eye correction and setting up a photobook. Interestingly, the Erase option doesn't have a Select and Erase. It has Erase All or when you're looking at the pictures you can erase individual pictures by pressing up on the navigation pad. In the box, you get a sealed pack that contains a Getting Started manual, a CD ROM with the installation drivers for your computer. There will also be a full manual and a basic photo editing suite. A USB cable, wrist strap, lithium ion battery and pen for the touch-screen accompany the camera.